Utilize advanced effects to reduce distractions and enhance window behavior. It can be difficult to stay focused when multiple windows are open. WindowFX helps you stay on point by dimming or blacking out other windows as your focus shifts between them. Selectively set windows to be transparent so you can see more of what's happening. Monitor real-time changes in background windows while actively working with a foreground window. Easily manage your windows with Tiles by dragging them to the corners and edges of the screen to automatically resize or pin them. Easily manage your windows by dragging them to the corners and edges of the screen to automatically resize or pin them. Automatic window transparency when moving windows not only makes positioning them easier, but also helps keep sight of what else you have open. 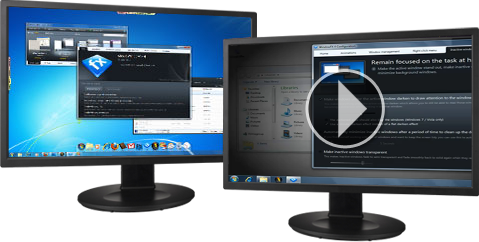 Send windows between monitors by using simple and quick flicking motions. Use with touch-enabled devices for even more intuitive windows management. Access a variety of options in WindowFX to make your windows more usable: pin on top, disable Aero peek, disable Flip3D, set custom sizes when maximizing, and more.